Deck The Falls is a rip roaring comedy brought to the stage by Dungannon Thomas Clarkes' GAC on Friday 30th December. The comedy is about two Belfast bouncers who have plans and scams as they search for Robert, but who is Robert? and why is there two greyhounds on the run, never mind the two 'auld' dolls having a dilemma? However the real talking point of the new season is Bardic's latest musical offering, Elvis inspired musical 'All Shook Up' which opens on Friday 3rd February for a limited run. All Shook Up tell the story of Chad, a guitar-playing, hip-swivelling stranger who rides his motorbike into town. Is he The Devil In Disguise or a Hound Dog in his Blue Suede Shoes? The townsfolk are about to be All Shook Up and could be headed for Heartbreak Hotel, but for Natalie, the love-struck, tomboy mechanic, it really is Now or Never. Packed with twenty-five of the best loved songs by The King himself, All Shook Up is a funny and moving tale of hope, second chances and the healing qualities of Rock’n’Roll. Produced and directed by Stephanie Faloon it features a host of familiar faces all whom are no stranger to any stage. Early booking is advised as many nights are near full house. If drama is more your idea of a night out, then what better way with a choice of two great Irish dramas. Following their successful visit to The 2nd International Martin McDonagh Festival in the City of Perm, Russia, where they picked up the Major Award with their presentation of Martin McDonagh's "The Cripple of Inishmaan", Bardic/Premier will present "The Lonesome West" a dark, hilarious comedy by the same author, which tells the tale of two brothers, one whom has killed their Father, but are closeted together in undying hostility. 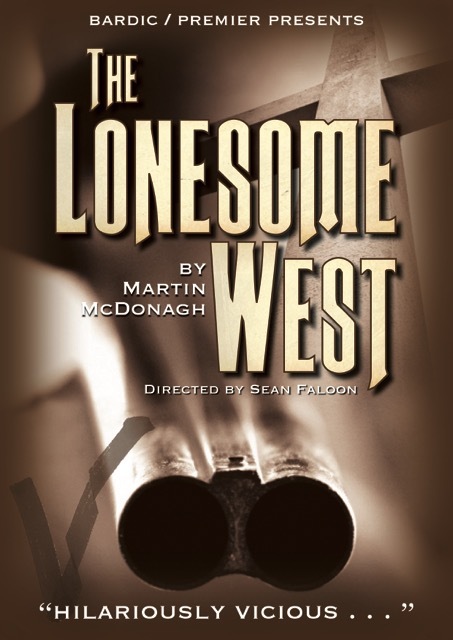 "The Lonesome West" opens on Friday 24th February for two nights only, before embarking on its Irish tour. Telly stars Mary McEvoy (Glenroe) and Jon Kenny return to Bardic in 'The Successful TD' on Saturday 25th March in a new play based on 'The Letters of A Successful TD' and 'An Irish Minister of State'. Both by John B Keane. Completing THE 016/17 season, is a visit from 'Mrs Brown's Boys' actress Eilish O'Carroll, best known for playing Agnes' close friend Winnie McGoogan, in her brother Brendan's BAFTA award winning sitcom. Eilish an accomplished actress and performer in her own right, will bring her one woman show 'Live, Love, Laugh' to Donaghmore on Sunday 23 April. Tickets for all shows are available online from www.bardictheatre.com and Bardic Box Office at Stewart's Music Shop. Telephone bookings on 028 87 761 859.